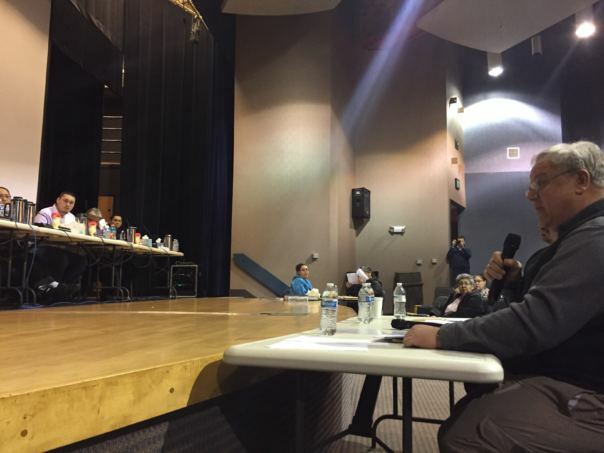 A high-profile guest was in attendance at the North Slope Borough Assembly meeting in Utqiaġvik Tuesday. The Interior Department’s second-in-command, Deputy Secretary David Bernhardt addressed the mayor and the assembly members at the Barrow High School Auditorium. “We’re here today to begin a conversation with you because we want to have you collaboratively and collectively involved with us as we go forward with our new job,” Bernhardt said. That new job is managing the oil and gas leasing program in the Arctic National Wildlife Refuge, which is within the North Slope Borough boundaries. “We want to hear your voice, we want to understand your issues, we have an opportunity to try to accommodate those issues that are of concern to you within our authority,” Bernhardt said. Assembly members had the chance to comment and ask questions. North Slope Borough Mayor Harry K. Brower Jr. thanked the Deputy Secretary for coming. He then went on to say that oral communication is one thing, but he wants to start seeing plans in writing. “You know, I first thing I wrote down was, when do we start reading the information in black and white. In written materials. That’s something of importance,” Brower said. Bernhardt responded that once the scoping process begins, more of those materials will become available. He also said he expects that process to kick off in the next few weeks. After the meeting, Bernhardt was also asked why three critical whaling areas were included in the initial draft of the Trump Administration’s plan for offshore leasing. Local stakeholders have identified those areas for exclusion in years past. The Deputy Secretary said he will also be visiting Fairbanks and Nome on this trip.